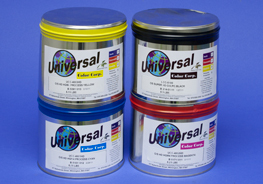 Universal Color Corp. located in Wilmington, Massachusetts and Megami Ink Mfg. Co., Ltd. of Japan have made it a priority to provide the printing industry with the highest quality ink that is also environmentally friendly...soy ink. 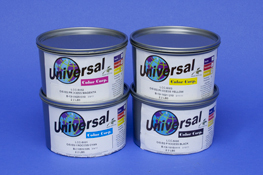 The environmentally sound manufacturing practices of Universal Color Corp. and Megami Ink have been recognized as utilizing the leading standards in the industry. As a result, both have been approved for ISO-14000 certification, the international standard for environmental management systems. The "soy seal" which is approved by the American Soybean Association (ASA) is proudly displayed on Universal Color Corp. and Megami Ink products. 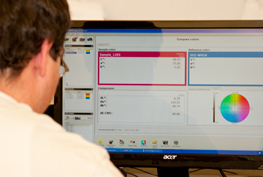 In order to obtain the soy seal, ink must meet the following conditions: For all offset inks, soy oil needs to account for more than 20% of the gross weight. 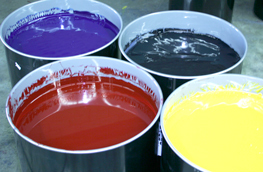 In the case of UV ink, the standard is 7% and 10% for metallic ink. One ink for ALL your printing needs! The HGM4 series is the most popular ink on the market today! Tested against the top competition, it has outperformed all in every aspect of print quality. Approved for SWOP and G7 color management.